ICE - In Case of Emergency. Are you prepared? A few days ago, a friend introduced me to the ICE (In Case of Emergency) campaign, which encourages people to add a contact in their mobile phones under the name "ICE" so paramedics, police or firefighters know who to contact in case of emergency or accident. I was surprised to learn that the ICE campaign has been running for a few years now - it appears I'm a latecomer to this concept, but this is still an important campaign and one which I would sincerely encourage all Glamumous readers to consider. The ICE campaign was started by Bob Brotchie: a paramedic with the East Anglia Ambulance Service who realised that while most of the people he attended had mobile phones with them, he and his colleagues were unsure which contacts to call in case of medical emergency. To ensure paramedics and emergency personnel know who to contact if we're involved in an accident or medical emergency, we need to add an ICE contact to the phone book on our mobile phones. The ICE contact is the first number paramedics will try to call for medical information and to inform of your current situation. This means that if my husband does not answer immediately (due to his job he's often unable to answer calls), my dad or mum may be contacted instead. I've also programmed ICE numbers into all of my children's handsets too, with details of our emergency contact numbers. If you don't already have an ICE contact programmed into your handset, please do yourselves a great big favour and add this right away. Perhaps add one for your partner and children's handsets too, so you can be sure you and your whole family are covered in case of emergency. 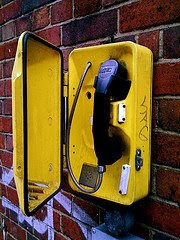 Image credit: Emergency Phone by Futureshape.